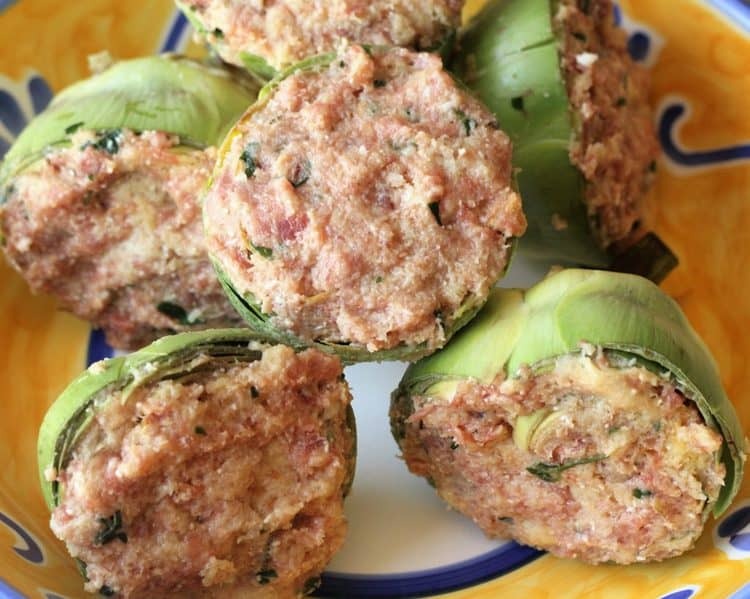 Continuing on with the stuffing theme, (last week I shared a stuffed pepper recipe) I’ve been meaning to make these stuffed artichokes for the longest time. I have been putting it off because for some reason I’ve always been intimidated by artichokes. 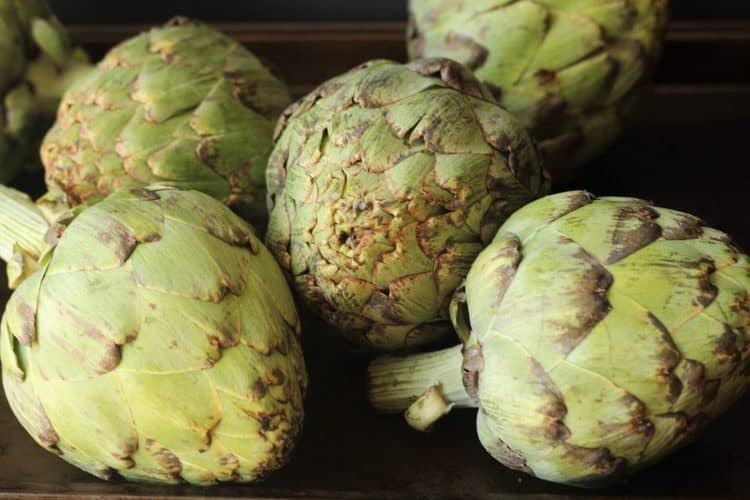 Although I do enjoy artichoke hearts in your typical antipasto plate and have also made that typical rich and creamy artichoke and cheese dip, I think I have only cooked with fresh artichokes one other time in my life. I’m always unsure of how to prep them, how many layers of leaves to remove, how to easily remove the choke and so on. So when I walked into the grocery store this week and saw these beautiful artichokes on sale, I decided the time had come for me to finally cook them. But not with just any old recipe. It was time to make my mom’s stuffed artichokes. 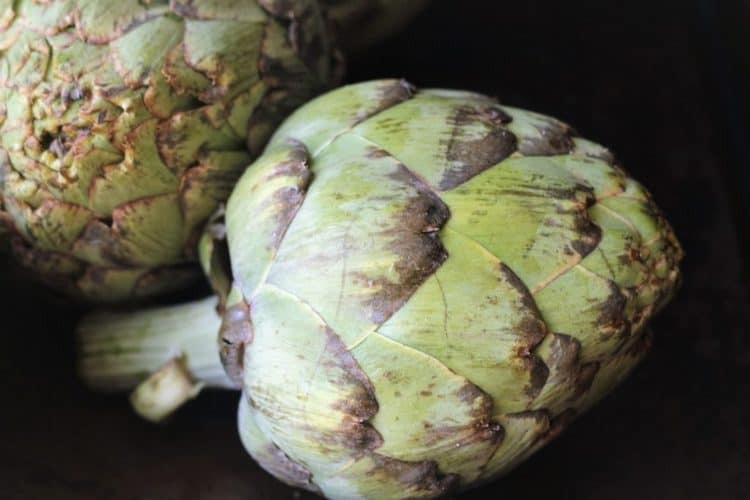 My mother always makes a complete meal with the artichokes by cooking pasta (usually small shells or tubettini) which she then serves with the vegetables and broth that the artichokes are cooked in. Prepare a large bowl filled with water and a lemon squeezed into it. Cut about 1 inch off the top of each artichoke. Remove the tough outer layers of leaves. I removed about 2 layers but this will depend on the size of your artichokes. Trim the fibrous outer layer of the stem. 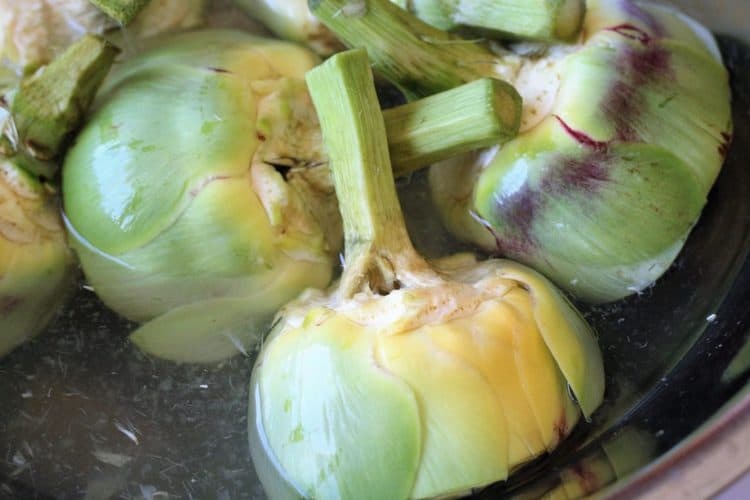 Normally you would remove the entire stem but in this recipe the stem will be a useful handle when browning the stuffed artichokes in oil. Spread the leaves apart with your fingers and using a spoon, scoop out the fuzzy choke in the centre (the pink or purple colored centre as seen in the photo above). 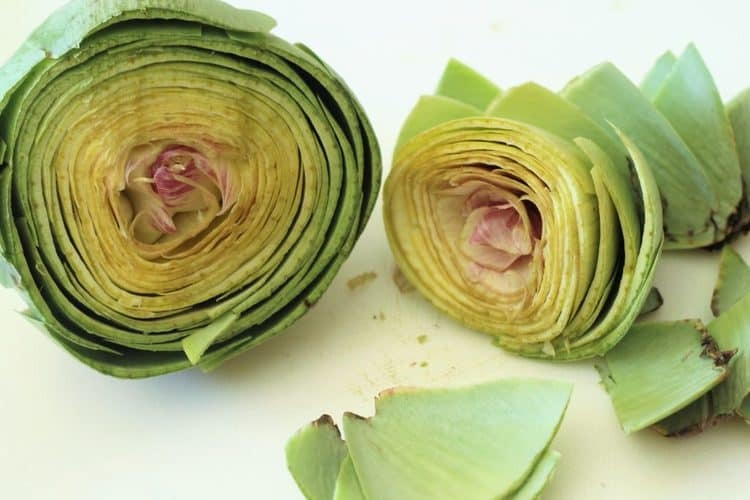 Place the artichoke in the lemon water to prevent from turning brown and continue with the rest of the artichokes. As a child I always ate the stuffing in the artichoke and then left a pile of leaves on the side of my plate. I would watch my father remove the artichoke meat on each leaf and create a pile of discarded leaves in a separate plate and quite honestly I did not find the process very appetizing! Let’s face it, eating artichoke leaves is not very elegant. As I got older I decided to finally taste the artichoke leaves and found that I enjoyed them. These stuffed artichokes are the only way I have ever eaten artichokes but I think now that I have learned how to prep them for cooking I am ready to take on new recipes. 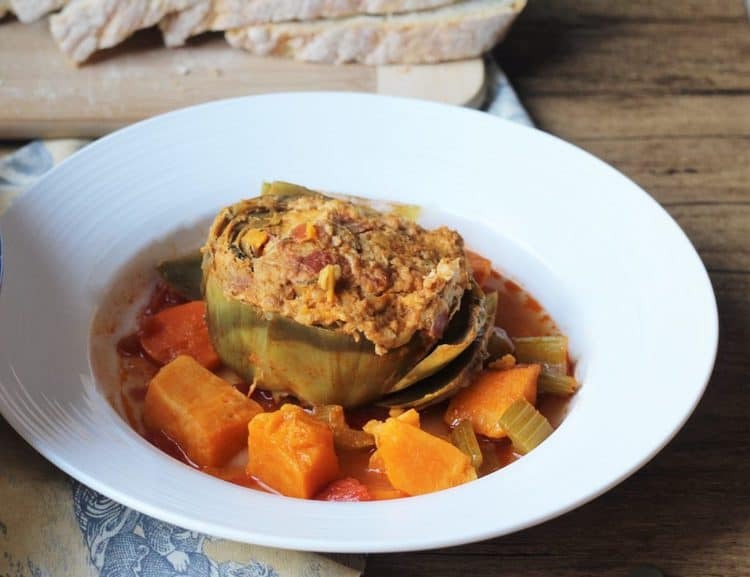 But first I need to share with you my mom’s traditional stuffed artichoke recipe. 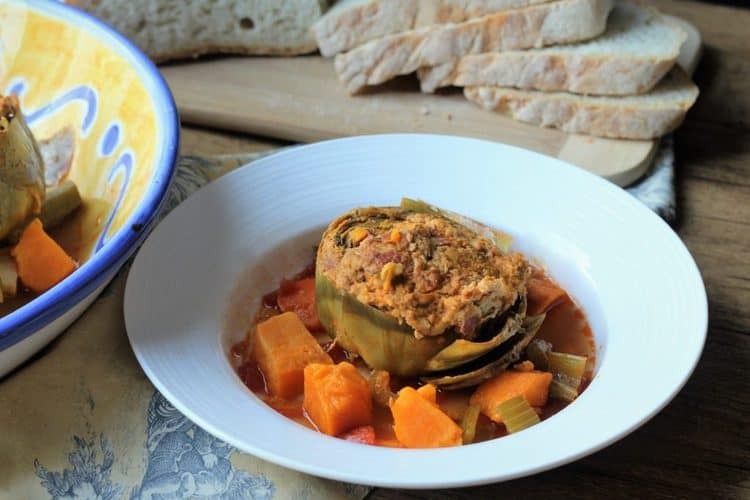 My mother's stuffed artichokes are stewed with vegetables in a fragrant broth and typically served with pasta to create a complete meal. 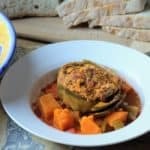 Trim artichokes as described in text above and place in large bowl with water and lemon juice as you prepare the stuffing. 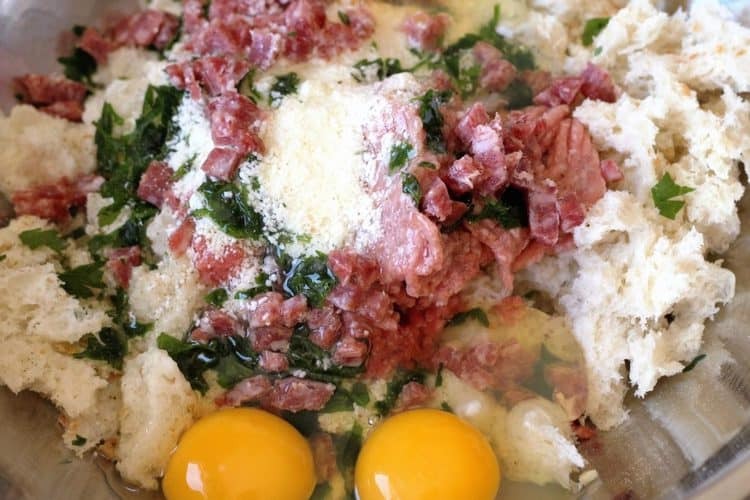 To prepare the stuffing combine all ingredients (breadcrumbs to salt and pepper) in a large bowl and mix well using your hands. Prepare a large dutch oven by adding enough oil to cover the bottom and heat on medium high heat. Remove the artichokes from the water and pat dry. 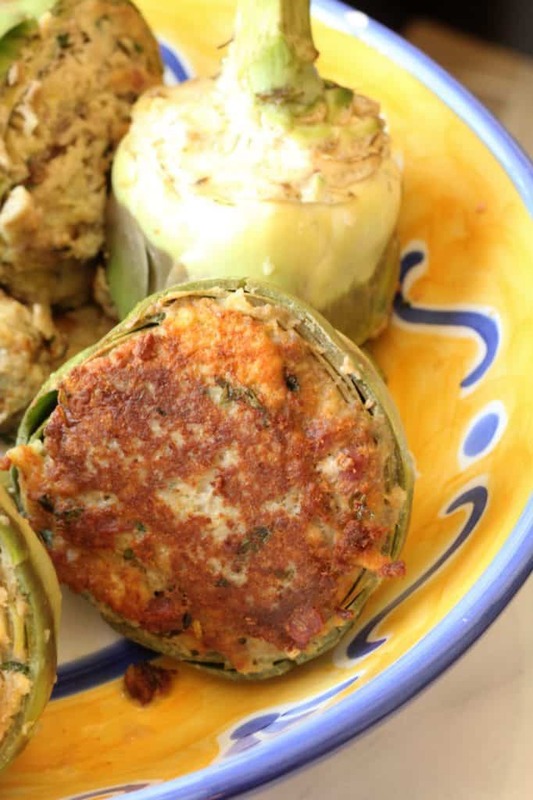 Spread the leaves apart with your fingers and add 1/6 of the stuffing to each artichoke. Place face down in the hot oil and brown for about 5 minutes. Do not overcrowd the dutch oven, if necessary fry in batches. When browned, transfer artichokes to a plate. Remove all but 2 tablespoons olive oil from the dutch oven. Add the diced tomatoes and bring to a boil. Return the artichokes to the pot. Cover with water and bring to a boil. Once the water has come to a boil, add the cubed vegetables. Add salt and pepper to taste. Bring to a simmer, cover and cook for about 1 1/2 hours. If desired, cook small pasta (such as shells or tubettini) in a separate pot and serve with the broth and vegetables. I haven't eaten stuffed artichokes for years. My mother and mother-in-law made the best. I don't have either recipe. Your recipe is very much like theirs. It invokes happy memories! Thanks for sharing. Glad it evokes pleasant memories Lily!